Over 1 billion people today do not have access to safe water, roughly 1 out of 6 people worldwide. More people die each year from unsafe water than from all forms of violence, including war. In the developing world contaminated water accounts for 80% of all diseases, including cholera, hepatitis, typhoid, dysentery and parasites. African woman and children bear the burden of walking for water an average of 4 to 8 miles a day. 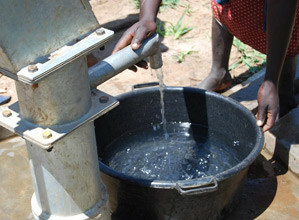 African women expend 85% of their energy every day getting water for their families. Physical ailments plague African woman carrying Gerry cans on their heads weighing an average of 44 pounds. Each flush of the toilet uses the same amount of water that one person in a developing nation uses all day for washing, cooking, cleaning, and drinking. The average American family turns the faucet on between 70 – 100 times/day. The typical American family uses 200 gallons of water a day while the African family uses on average 5 gallons a day. Some 6,000 children die every day from disease associated with the lack of access to safe drinking water.